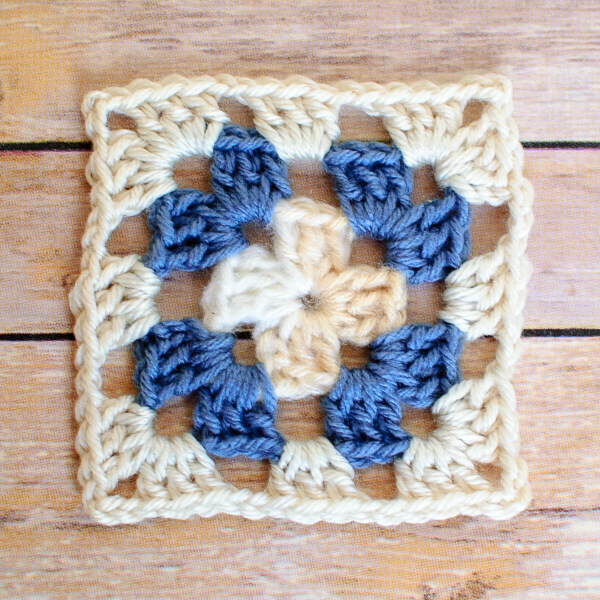 Are you ready to learn how to make a crochet granny square? 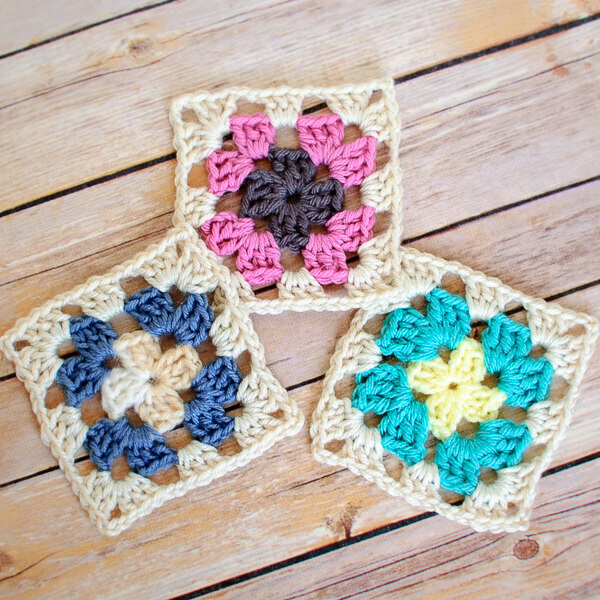 I love, love, love granny squares! They are quick and easy, so portable (think summer project! ), a great way to play with color, and awesome for getting rid of all those yarn scraps. You can see how I used them to make this pretty crochet granny square afghan here with my leftover bits of yarn. I love how it came out!! Want to make one too? Here is a basic crochet granny square pattern to get you started … Make sure to also check out my Granny Square Blanket Pattern for how to join the pieces together and work a perfect granny edging. Note: Feel free to use different yarn weights from your stash … I use two strands of sock yarn or lighter weight yarns and separate strands from chunkier yarns for consistent sizing. Round 1: Ch 3 (counts as dc), 2 dc in ring, ch 3, *3 dc in ring, ch 3, repeat from *twice more, join in top of beg ch, drop CA — 12 sts. Round 2: Join CB in any ch-3 sp, ch 3 (counts as dc), work [2 dc , ch 3, 3 dc] in same ch-3 sp, ch 2 *[3 dc, ch 3, 3 dc] in next ch-3 sp, ch 2, rep from * twice more, join in top of beg ch, drop CB — 24 sts. Round 3: Join CC in any ch-3 sp, ch 3 (counts as dc), work [2 dc , ch 3, 3 dc] in same ch-3 sp, *ch 2, 3 dc in next ch-2 sp, ch 2, [3 dc, ch 3, 3 dc] in next ch-3 sp, rep from * twice more, ch 2, 3 dc in next ch-2 sp, ch 2, join in top of beg ch, drop CC — 36 sts. Are you left handed? 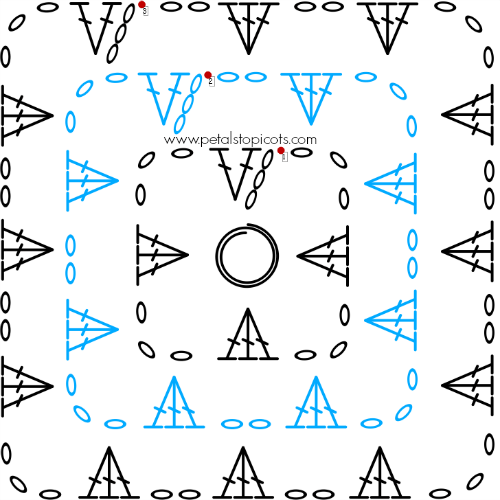 You can find a left handed crochet stitch diagram here. As you can see, I used yarn scraps for Rounds 1 and 2 and then chose a soft cream for Round 3 of each. Be sure to check out my post here to see how I am join them using my favorite method … the Join As You Go (JAYGO) method. All these posts are making me so excited to see the finished project! These are so pretty! I love the colors you used. Weaving in ends is my least favorite part 🙁 I weave the in one by one being sure to go back and forth to lock the tail in place. I loved doing a granny square pattern. I have to say though I was so disappointed that once I put it all together, the squares started to break apart in the middle of the squares (not at the edges where they were joined together). I did one afghan and I am thinking I may never do grannies again because of it. One friend told me that my gauge was too tight. I honestly could not say yes or no to that one. I tend to just crochet and it will be what it will be. So I suppose that’s possible. I will say that I used Red Heart yarn that i had in my stash for years before ever doing anything with it. Could age also be possible? It sounds like you enjoy granny squares which is why I post this. I’d like to love Granny Squares again, but I don’t want another disappointment after working so hard on it. Just an idea… If your magic ring isn’t working for you, you could do the traditional chain into a ring option for a more solid hold.